The eInk display technology (the same one that is used on Kindle screens) has a new rival. Far more than LG’s micro foil technology that is used by Hearst, Qualcomm’s Mirasol display technology is threatening to overtake eInk by the end of this year. Mirasol, as we reported earlier, is a new display technology that is being developed by a team of researchers under the banner of Qualcomm — their primary sponsor. The main advantage of this technology is that it has the capability of producing RGB pixels. That means full color displays. And it doesn’t stop there either. Mirasol can also display video and decent frame rates and according to those who saw the demo at CES 2010 — it is a very promising new technology. Because even though the screen is doing full color video, the developers claim that it has a 6x battery advantage over eInk under average eInk usage. The overlaying of a capacitive touchscreen allows the screen to become touch enabled but reduces the display’s sharpness slightly. Still, it is supposed to be capable enough to take over the eInk displays. To give you an estimate – if your eInk display device lasts one full day on a single charge, the same device will last for 6 days on the same single charge and battery if it uses a Mirasol display. Of course, this is all theoretically speaking but the real world value is still likely to be quite high. Mirasol can easily be read under direct sunlight like the eInk screens and it can also be evenly backlit for dark situations – something that the eInk screens are not equipped for. 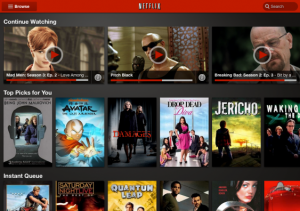 Mirasol is likely to hit by the end of 2010 and the first screens will be around 5.7 in size — enough for medium sized eBook readers and may be even tablet devices. Watch the video for a look at what it looks like. Mirasol v/s e-Ink: What’s The Future? Qualcomm is funding the development of a new type of display technology called Mirasol and it is being touted as the future of eBook readers. That means it will replace the e-Ink technology that our beloved Kindle uses. So how does it work and why is it (reportedly) so much better? Mirasol has been developed by mimicking a feature that makes the butterfly’s wings shimmer. It uses no back lighting, just like e-Ink and uses incidental light to reflect it back through a special layer. This layer is made up of multiple microscopic membranes that can be change through electric current. Once they change, they remain static in that state until another electric charge causes them to change again. This means they do not use electricity during a period of no change. Their main advantage is that these membranes can produce the three main colors used in modern color displays – Red, Green And Blue (RGB) – and hence can produce a vibrant colored image. They also produce very impressive blacks (at least in theory) because in their closed state they reflect no light at all and have no other source of light. Due to their design, they are able to run higher frame rates, thus making smooth videos a possibility on the display. Currently, pushing the frame rate up on the e-Ink would cause it to consume more battery. That is because e-Ink uses tiny microcapsules that have three states – Black, white amd mixed. Changing them through negative and positive charges creates the same effect as LCD pixels. But since they contain physical particles, they do not need any backlighting. But making them support RGB would require highly specialized particles and higher frame rates would require much more current. How this will affect eBook readers is still debatable but if it does become viable, then Amazon might consider switching. We just have to wait a bit more to see how it pans out. 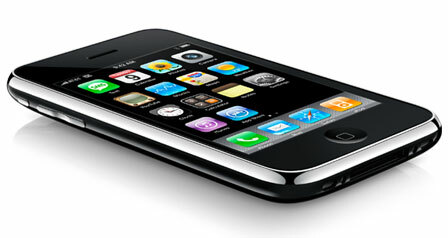 Qualcomm intends to have it in the market by the end of 2010. Thin and flexible e-ink displays is one the advances that has been a long time coming. 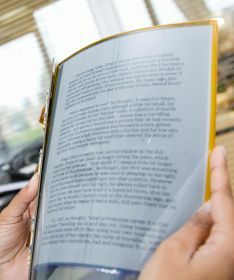 Plastic Logic hopes to bring us this amazing technology by 2009, a cross between the Kindle and actual paper. Spun off from Cambridge University in 2000, Plastic Logic is now based in Mountain View, California, since 2000 they have been working hard to produce a semi-transparent sheet of tough plastic which can create and erase static images. Plastic Logic haven’t mastered animation yet, but they don’t think it will be too long before they do. Whilst its headquarters are in Mountain View, California, it also has a manufacturing centre in Dresden, Germany, which is scheduled to open in September 2008. Plastic Logic says its product will be on the market in early 2009. The company has taken over $200 million in funding to date, and other $50 million funding earlier this year, so all those investors will want to see what products Plastic Logic can come up with. The obvious application is newspapers and magazines, whether it will be economically feasible for newspapers to ‘print’ on this new generation of e-ink displays is another matter. 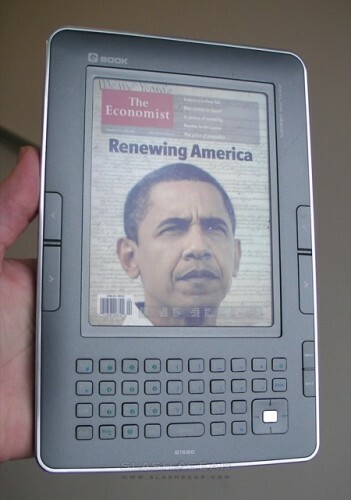 One possible way of turning a profit for the newspapers could be to sell monthly subscription, with a built in wireless receiver, the flexible display could receive updates for a month before asking the user to renew their subscription. 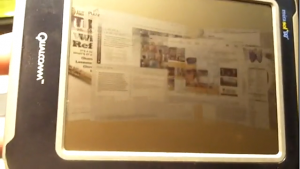 But, I think the most likely–and most profitable–application will be displaying ads on posters and billboards. You may of heard that over the weekend Apple unveiled it’s new iPhone 3G device, there has been a lot of buzz surrounding the device, mostly because of the software, the actual hardware is not that impressive and mostly includes improvements that the original iPhone should have shipped with in the first place. The iPhone 3G comes in at a impressive $199 to buy, however you will be paying more in the long term compared to the classic iPhone with higher network subscription charges. Now how does the new iPhone effect us Kindlers? well… Apple has done something remarkable with the software – they have opened it up! which is impressive considering we are talking about Apple here. All this has allowed third party developers to create e-book apps for the iPhone 3G and has turned the iPhone into a e-book reader. There are already a couple of iPhone e-book reading apps out already, the iPhone Bookshelf is one which supports multiple formats. Another promising e-book app is Stanza. Stanza is an app which lets you read e-book which are stored on your iPhone and e-books online, make sure you check out the demo at the bottom of the page. Stanza can also read files in the ePub format, which many other apps are able to work with, perhaps the Kindle will eventually support ePub aswell one day. The only annoying thing about reading an e-book on the iPhone is that each e-book comes as its own individual app, with its own icon on the iPhone home screen, Apple could have done a better job of categorising e-books or even better creating their own e-book reading App. There is still some speculation on whether Apple will create a dedicated e-book reading device, but for now we know e-books are on a Apple device through third party apps, if you couple this with rumours that Apple is in touch with major publishers this would support the theory that Apple is working on its own e-book reader, or at least a e-book store. Will the touch screen make it easier to read an e-book? I don’t know since I don’t own a iPhone or iPod Touch, but I suspect that it might be a bit easier to read with the iPhone, swiping the screen to turn the page seems a more natural gesture than pressing a button, however you will be using both hands, whereas with the Kindle you need only use one. With the Kindle accidentally turning the page can be quite frustrating, I cant see it happening on the iPhone. You can watch our buddy Walt Mossberg review of the Apple iPhone 3G in the video below, he mentions the e-book reading capability of the device. Can Apple with its new iPhone 2.0 software challenge Amazon? Portfolio contributing editor Kevin Maney interviewed Jeff Bezos in a packed auditorium at New York University’s Stern School of Business. Bazos and Maney discussed many topics during the lengthy 1 hour 30 minute interview – everything from Bazos personal life, how he makes business/personal decisions, the founding and growth of Amazon, Amazons Infrastructure Services, Amazon Prime, Amazon A9 and of course the Kindle. It is a very in depth interview, Bazos goes into great detail about what the vision is for Kindle and how Kindle came to be – it is a fascinating interview and if you have the spare time its well worth watching. We don’t all have a couple of spare hours every day, so if your just interested in what Bazos has says about the Kindle then you can skip most of the interview – Bazos starts talking about the Kindle in part 3 at 3min 25sec into the interview. Portfolio: Let’s talk about the Kindle. What do you want it to be? Bezos: Any book, in any language, ever in print should be available in less than 60 seconds. We worked on it for three years. It’s been selling out since being released. Portfolio: You sold how many? Bezos: You asked that so innocently, but you know I’m not going to answer. We have a long-standing practice of being very shy about disclosure, and I’ll stick to that practice. The Kindle has substantially exceeded our expectations. Portfolio: Every effort at e-books has failed. Why should this one work? Bezos: We decided we were going to improve upon the book. And the first thing we did was try to determine the essential features of a physical book that we needed to replicate. The No. 1 feature is that it disappears. When you’re in the middle of reading, you don’t notice the ink or the glue or the stitching or the paper — all of that disappears, and you’re in the author’s world. Most electronic devices today do not disappear. Some of them are extraordinarily rude. Books get out of the way, and they leave you in that state of mental flow. Portfolio: How do you improve on that? You can watch the full interview 6 part interview here. 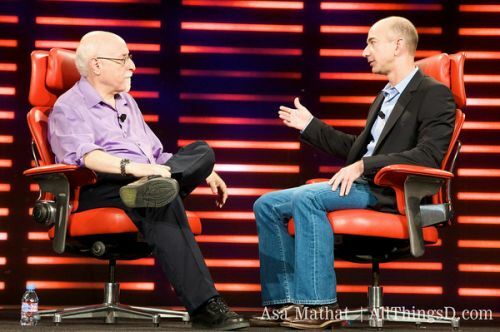 Our old friend Walt Mossberg sat down with Amazon CEO Jeff Bezos this morning at the “D: All Things Digital Conference”. Walt Mossberg gave the Kindle a luke-warm reception back in November calling it “mediocre” and “marred by annoying flaws”. He liked the idea and the shopping experience behind the Kindle, but thought that the device itself was where Kindle’s flaw lied. Jeff Bezos does his normal sales pitch about the Kindle, but this time he throws in a bit of new information about Kindle sales. Walt asks point blank “How many Kindles have you sold?” Jeff politely refused to answer the question instead he gave us a new stat: “Title-by-title basis…Kindle unit sales more than 6% of total book sales”. So of the 125,000 titles available for Kindle, of all those 125,000 titles that were sold — digital and print — Kindle accounted for 6% of sales. Jeff also said he envisioned a time when e-book sales formed a substantial portion of book sales at Amazon. It may take a decade to get the product to where Amazon wants it, he said. So this has confirmed what many thought, that Amazon is committed to the Kindle and there will be a Kindle v2 release sometime in the future. The interview wasn’t just limited to talk about the Kindle, Bezos also talks about the streaming video-on-demand service for Amazon, which will be released in the next couple of weeks amongst other things. You can see the interview below in 2 parts. 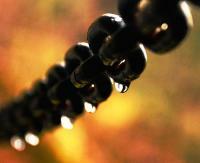 Every Sunday night we will bring you our selection of Kindle and Amazon related links from around the web. Compiled from blogs, magazines, main stream media and other sources, we hope these links will give you a definitive overview of what’s happening regarding the Kindle and what the Kindle community is talking about.